The American Society of Sanitary Engineering created the ASSE 1060 Standard in 1996. There are five main aspects of a protective industrial enclosure which the ASSE determined were important. A manufacturer submits their products to the ASSE to be tested in a lab thereby earning a stamp of approval. Typically, a design engineer will be sure to note that any backflow preventer enclosures must be ASSE certified. However, that specification is still missing something as most municipalities need a certain class of enclosure. Here's how to tell what you need. If your town ever gets frost or snow, you want to make certain your backflow enclosure is ASSE 1060 Class 1 approved and contains a heater. A class 1 protective cover has been thoroughly tested to ensure it will maintain 40° Fahrenheit in as low as -30° Fahrenheit weather. 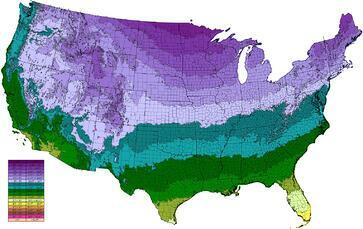 The map below shows the average winter temperatures for the United States. All of the areas shaded with purple hues have average temperatures below 32° and would certainly require freeze protection. Many of the areas on the map that are blue, have average temperatures above that, but often still fall below sometimes. It's highly likely those areas would need full freeze protection as well. ASSE 1060 Class 2 backflow preventer enclosures provide frost protection. This means they can be used in areas that reach temperatures as low as 33° Fahrenheit. If your municipality sometimes falls below that, you could end up with a frozen backflow preventer and huge problems. The frost protection comes from a backflow cover that is insulated. This insulation is measured by R-value. Some enclosures contain rigid foam insulation, while others use polyisocyanurate board insulation, which has the highest R-value per inch of any rigid board insulation. Class 3 covers do not offer much, if any, protection from cold or otherwise incliment weather. They have not been built for or tested to maintain a certain temperature in cold or freezing conditions. Typically, ASSE 1060 Class 3 backflow preventer enclosures are only used to protect equipment from theives, vandals, and accidents. 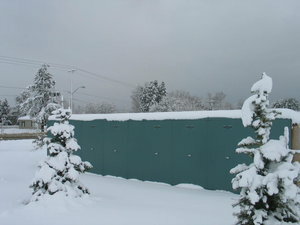 There are only a few municipalities in the United States that can utilize these types of enclosures without problems. Of course a class 1 enclosure will be more expensive than than one with less protection. However, this is a pay me now or pay me later situation. The pay me later ends up being much more expensive. Not only will you end up needing to buy an enclosure heater eventually, but the water supply could be interrupted when the backflow preventer freezes. That can cost several thousand dollars without even considering the downtime. A replacement backflow assembly won't just be sitting on a shelf at home depot or even the local waterworks supply house - they usually need to be ordered. Don't get stuck with a frozen backflow preventer next winter. Choose the backflow cover with the protection your municipality needs.